Need transportation to Austin? Dallas to Austin Limousine Rental Services Transportation will get you there. 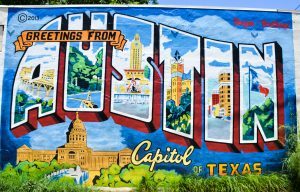 Austin is the music capital of the US it is also the capital of Texas! No matter your group size, book a party bus, limo, sedan or shuttle and charter bus for your ground transportation to Austin tonight! We are happy to book a ride to Austin from Dallas for you as soon as you need it. A Party Bus will definitely help the time pass on your way to Austin. Available for all group sizes, blast some music, have a drink and enjoy fun with friends and family. Just a few of you and don't want to fly? No worries, we have you covered with Luxury Sedans that fit up to 3 people and luggage from Dallas to Austin. Do you have more that 3 people? Mercedes Sprinter Van is your best and only choice for small group transportation from Dallas to Austin. Check out our affordable rates. Heading down to Austin for one the many epic music festivals? Take the whole group and travel together in a Shuttle Bus starting at 20 passengers and up. No one left behind with Charter Buses up to 56 passengers and even more luggage space for that long trip to Austin!